April | 2017 | Relaxed. Transitioning. Natural. Beautiful. If you want something lighter (and less oily) than the DIY Eco Styler custard, just turn your fave Eco Styler Gel into a moisturizing hair cream or twist butter. Place 2 TBSP raw, unrefined shea butter in a double boiler. I like ivory shea butter best but, if you like, you can also use yellow shea butter. They both come from the nut of the Karite tree. However, yellow shea butter has Borututu tree roots (a medicinal plant) added during the milling process to give it a golden color and to make it slightly more firm. NOTE: If your shea butter is pure white in color, it is refined. As someone who is 67% West African, in my family, buying refined shea butter is a cardinal sin! It’s just not done. Besides, the refinement process (i.e., bleaching, deodorizing, etc.) can leave harmful toxins in the final product. It also tends to remove most of the beneficial properties of shea butter, which pretty much defeats the purpose of buying shea butter in the first place. Add 2 TBSP castor oil. Once the shea butter and castor oil melt, remove from heat and let cool for 2-3 minutes. Add 10 TBSP Eco Styler Argan Oil Gel (⅝ cup). Eco Styler Argan Oil Gel is my favorite Eco Styler gel, but you can use any one you prefer. Add 3 TBSP of rose water. Whip with an electric hand mixer on medium speed. I remove one beater (i.e., only use one beater) for this whole process to avoid overcrowding the bowl or having to use a vessel 10x larger than necessary. Add ½ tsp vitamin e oil. Vitamin E is an antioxidant that reduces scalp inflammation and helps to repair damage to hair follicles. It also helps to extend shelf life. I like the Sundown Naturals brand. OPTIONAL (but highly recommended): Add essential oils for fragrance and to extend shelf life. 10 drops rose geranium: prevents dull, limp hair and strengthens hair follicles. 10 drops bergamot: promotes hair growth and prevents scalp buildup. Mix one final time to incorporate all ingredients. Transfer to an 8 oz. container. Product will continue to thicken as it comes to room temp. If you would like it to thicken more swiftly, place the finished product in the fridge for an hour and then remove. NOTE: This DOES NOT have to be stored in the fridge! But, letting it chill in the fridge for an hour will thicken the cream at a faster rate. 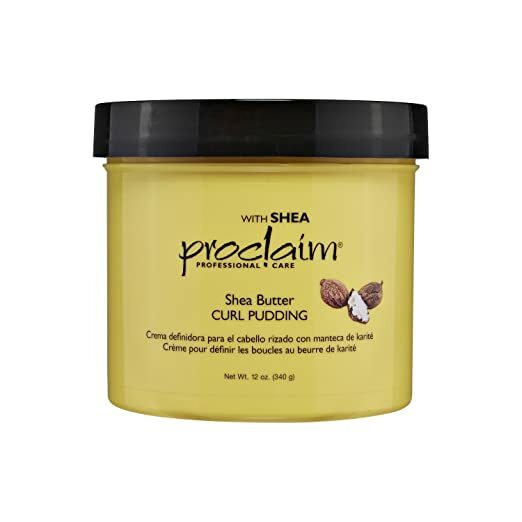 The Proclaim Shea Butter Curl Pudding is sulfate, paraben, gluten, and silicone free. It contains a blend of shea butter, biotin, and honey. It claims to define curls while moisturizing dehydrated hair. Apply curl pudding to clean, damp hair, and smooth to style. Then, , and do it again! Quick Tip #17: Use Coconut Oil CAUTIOUSLY! Ok, scientifically coconut oil IS NOT a protein but, in a sense, I feel like it behaves like one because it contains lauric acid (a medium chain fatty acid that binds easily to protein in hair). 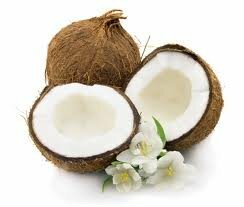 Because of this, coconut oil has the ability to penetrate the hair shaft (due to its low molecular weight), reducing protein loss and strengthening the hair’s structure. It also creates a “hardening effect” due to its ability to change viscosity so quickly (i.e., from a liquid to a solid state) at low temperatures. As a result, harsh winter winds, for example, can create stiff hair very quickly. In addition, repeated use of coconut oil can cause protein build-up, drastically reducing hair’s elasticity and causing follicles to become dull, dry, brittle, easily tangled, and more prone to breakage. Have you been overusing coconut oil? If so, consider utilizing a deep conditioner or moisturizing hair mask to restore the protein:moisture balance of your hair. Need a complete restart? Try a reconstructor instead. We all know healthy hair starts from the inside out, so I thought I’d share with you an amazing snack company called Graze that lets you hand pick single snack orders and subscription snack packs. All of their snacks have NO genetically engineered ingredients, NO artificial flavors or colors, NO high fructose corn syrup, and 0g trans fat per serving. As someone who is constantly on the go, this makes healthy snacking thought-free! With flavors profiles from sweet, savory, and spicy to snacks that include protein, chocolate, popcorn, fruit, and/or nuts and seeds, you can easily customize your snacks any way you choose. All you have to do tell graze which foods you like, love, or would like to try. Then, they will create your box based on your personal preferences. Currently, graze boxes can only be shipped to US addresses within the 50 states. (Sorry international readers!) It is also important to note that graze IS NOT suitable for people with allergies. Graze packs all of their food in the same place, so their snacks may contain traces of gluten, wheat, eggs, nuts, soy, dairy, etc. Going on vacation or have an upcoming business trip? Postponing your graze subscription is super easy. Just delay delivery on your home page (one week at a time) by selecting the week you’d like to receive your next box. As long as they haven’t already started to prepare your next box, you’re good to go! I’m already on my second 8-snack variety subscription box from graze. I love it! It’s convenient AND tasty. So far my faves from my first box are the (1) sweet rhubarb jam—rhubarb, soft apple pieces and cranberries, (2) peanut butter and jelly—baked salted peanuts, raspberry fruit strings and vanilla fudge, (3) cookies and cream—mini cocoa cookies, white chocolate buttons, chocolate fudge and sunflower seeds, and (4) white chocolate dip and sweet blueberry toasts. And, the best part? Each 8-snack variety box costs just $13.99 including delivery. At any given time, graze has over 100 snacks available from which to choose. They add new innovative flavors to their range every 1-3 months. Graze uses the 80/20 rule when making boxes: be good 80% of the time, and treat yourself the rest of the time. In this way, graze strikes a balance between healthy snacking and treats that are (still wholesome but) simply a pleasure to eat! Because all of their snacks are perfectly portioned as well as self-contained in a portable individual package, you never have to worry about sacrificing your health for convenience. Just add a snack pack to your purse, gym bag, backpack, or briefcase, and you’ll never be stranded without a tasty snack (that happens to also be good for you) again! Use this rewards code (FTKFN2FTP) to get your FIRST (4-snack sampler) and FIFTH (8-snack variety) box free!